a couple weeks in June, had a very consistent 2104 year in running. The early days of January are often spent looking forward by looking backward. So with running in mind, I look back to 2013 to see what worked, what didn't work, and use that to build upon in 2014. It's something I recommend all runners do. I suppose a blog is a self-indulgent enterprise by definition, but trying to make this post slightly less than totally self-centered, I'll pass along some observations I think all runners could use. The biggest takeaway from 2013 is that it was one of the most successful years of running I've had in the last five years, and a big part of this was due to consistency in training. I've battled a bunch of injuries since 2008 and while a couple foot problems knocked me out for a couple weeks in 2013, it was a pretty injury free year. Late in 2012, I discovered in a routine trip to the running shoe store that I was cramming my size 14 feet into size 13 shoes. About a month after moving up to a size 14 shoe, chronic soreness in the ball of my right foot and left knee both subsided. I also have to give a lot of credit for running largely pain free to the leg and core strength exercises I discovered in Eric Orton's fine book "The Cool Impossible". Finding the right shoe size and working on core strength and balance really made a big difference in 2013, if for no other reason that I found myself a lot less sore at the end of runs and ready to go at it again the next day. 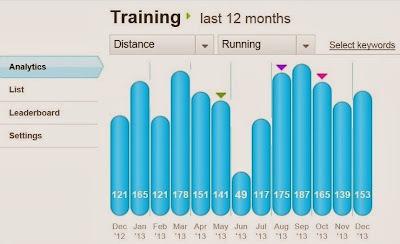 In 2013, I ran a total of 1736 miles which averages out to 33.3 miles a week, about five miles per week more than in 2012. I also did long runs as long as 15 miles at the end of the year as compared to previous years where about 12 miles was all I could handle before my foot pain became unbearable. The other half of the equation is that I did a lot of tempo runs in 2013 at a wide variety of distances ranging from four to fourteen miles. (More on long distance tempo runs here and four mile tempo runs here.) I'm a big believer that racing success requires putting the stresses on yourself in training that you'll experience in the race, and tempo runs do just that. Tempo runs, when done at the right pace, also allow for fast recovery. Successful training is balancing the yin and yang of tearing yourself down in the right way in order to build yourself back up, and tempo runs worked well for me in 2013 and I'll be doing more of them in 2014. It all paid off in the two major races I ran this year, the Santa Cruz Half-Marathon in April and the Monterey Bay Half-Marathon last November, as I was pretty pleased with both of these efforts. I've already started training for an April half-marathon, most likely the Marin County Half-Marathon. I wish you all the best for running in 2014 and for those wanting to chat more about running and training, you can join me on DailyMile.